» Read the Full Text! Throughout the twentieth century and into the twenty-first, comic strips and comic books have been a tremendously influential form of mass media. Superheroes: Good and Evil in American Comics brings together the work of artists, from Jack Kirby to Alex Schomburg to Will Eisner, who have defined and expanded the possibilities of a vastly popular art form. 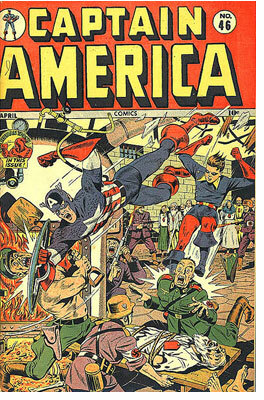 The exhibition will explore the ways in which works of comic book artists in the late 1930's and 1940's were inextricably linked to the socio-political realities of America at the time. At this moment, young artists, primarily immigrants or members of immigrant families in American cities, were pioneering a new genre of the comic book. This mode of art-making and story telling would become one of the most popular of all time. With the creation of superheroes and super villains, these artists and writers not only reflected their own private experiences as immigrants - frequently Jewish immigrants from European countries - but explored the very real battles of good and evil that were being fought internationally before, during, and after WWII. Superheroes: Good and Evil in American Comics has been organized for The Jewish Museum by guest curator Jerry Robinson, who joined the Batman team in 1939 and is credited with creating the infamous villain, the Joker, and naming the boy wonder, Robin, among other achievements. Alison Gass, Neubauer Family Foundation Curatorial Assistant, is serving as exhibition coordinator. © Copyright 2006 The Estate of Alex Schomburg. All rights reserved.